1. Cook the pasta according to the pack instructions. Heat a dry pan and toast the hazelnuts for 5 minutes, or until the skins are starting to crackle. Cool, then very roughly chop. 2. Drain the pasta, then cool for a few moments under the cold tap and drain again. Toss with the nuts, rocket, figs, cheese and dressing, then serve straightaway. Cook’s tipTry topping a Waitrose Stone Baked Pizza Base with the cheese, and bake until melting. 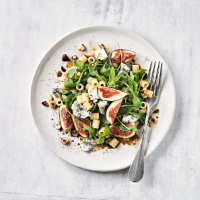 Add the figs, rocket and a drizzle of dressing.